It’s called The Wall, presumably because upon purchasing the product, it will take over space in your home to such an extent it will actually replace your existing wall. The tech company unveiled the thing, which measures a staggering, eye-watering 219-inches, at CES 2019, the mecca of all ridiculously extravagant and impressive technological feats of imagination and innovation. Imagine binging Game of Thrones on this beast. It’s technically the telly equivalent of The Mountain himself and, let’s be honest, Great Wars call for great LED displays, right? Well, The Wall certainly has it all – despite what you might expect. Samsung haven’t compromised quality for quantity of telly on this thing, so you’ll be able to see and hear every single touch of the ball during the footie as though you were actually there on the pitch in real life… If real life was f*cking massive. These transformative TV displays are made up of individual modules of self-emissive Micro LEDs, featuring millions of inorganic red, green and blue microscopic LED chips that emit their own light to produce brilliant colours on screen. If you find yourself over-compensating for something and thinking perhaps 219 inches just isn’t enough telly for a legend like yourself, you can even fit a bunch of screens together to create some sort of TV-watching Titan. The Wall 2019 takes personalisation to the next level, with modular panels that consumers can position in any size or shape to meet their needs. These next-generation modular Micro LED displays harness self-emitting technology to create elegant, efficient and powerful screens that are liberated from the limitations of existing technologies. As per the promotional video, it seems customers can even hang the TV screen portrait. It’s essentially like having a ginormous moving art installation in your house. …And when you consider Art (with a capital ‘A’) is one of the only commodities on the consumer market which only appreciates in price over the years, you can probably convince your mum The Wall is a very good investment just in time for Brooklyn Nine-Nine to hit UK small screens later this year. That is, if you can afford it. There’s no price tag yet. You can read that one of two ways: Either, you can’t put a price on quality entertainment, or you can’t put a price tag on The Wall because literally no one can afford it. 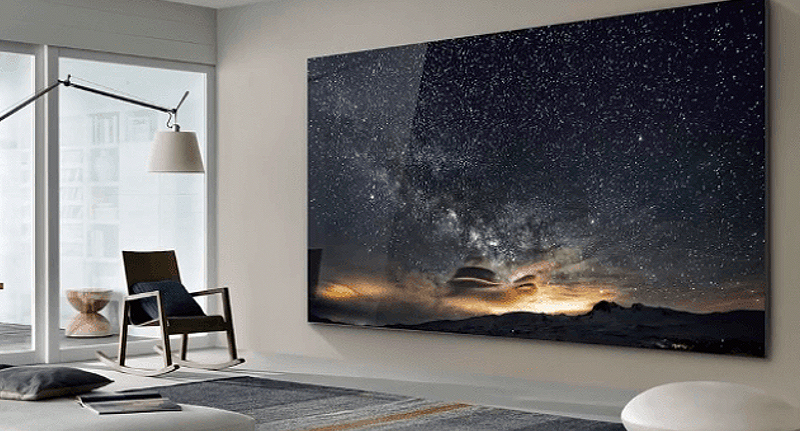 However, Samsung have invented a smaller option for those telly fanatics who either can’t handle The Wall or don’t want to get square eyes from one 20-minute sitting of Bojack Horseman. It’s been dubbed The Window and it was also unveiled at the same expo in Las Vegas. It measures in at a humble 75-inches. Do you really want to watch Stranger Things or Luther or Birdbox on a screen this size? You’d need a pretty big sofa to hide behind, and let’s be honest, you won’t be able to afford it after spunking your pay cheque on The Wall. If the size of the TV has any correlation to the vivid nature of your nightmares, you can count me out.